Poets House is a new boutique hotel in Ely which has literally opened up within the last few weeks, with a stunning view of the cathedral from most bedroom windows throughout. Situated on St Mary’s Street, opposite The Old Fire Engine House, this large townhouse-style hotel has brought us the sort of style I’ve personally been craving for a long time when it comes to an afternoon tea venue – Cambridgeshire truly does have a serious lack of stylish venues to enjoy afternoon tea. It’s very light in feel with glass & mirrors everywhere, so even though the decor as you walk through the main reception is very dark with it’s black & white furniture & tiling, it’s very light throughout the common areas. The reception desk is made to look like a library, with a huge shelf filled with hardback books, it’s very hard to keep your eyes off them as you are greeted, should you be a book lover like me. To the left of reception is The Dining Room with soft grey carpets & furnishings And an extensive menu to choose from throughout the day, with an a la carte menu through to Sunday roast with all the trimmings or even a more relaxed burger. It should suit everybody and anybody… But I was here for one thing in particular, naturally… afternoon tea. This saw me seated in The Study overlooking the courtyard complete with well kept topiary (although I think they need to be in the shape of books! ), which was a simple, yet stunning bare brick walled bar, with comfortable seating surrounded by lamps for a real homely feel. It was peaceful, just what I enjoy the most and I didn’t feel rushed at any point throughout my visit here. 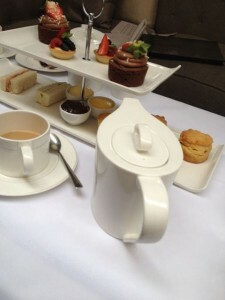 I was seated in a pre-set area, ready & waiting with a pot of tea to my liking brought over for me to start unwinding whilst I waited for my food to arrive. My afternoon tea companion for the afternoon was Leah Jenson, Executive Head Chef at Poets House and what fun she was too, she talked about her plans for Poets House for the future and their upcoming projects including a new venue near Newmarket. It’s a very exciting time for her and you could see this in the way she was talking about her experiences, an extremely interesting lady she is too! Leah had said to me before the food came out that she wasn’t sure she was happy with the afternoon tea stands, she felt that were a little too “white” and she may need something a little nicer or quirkier for the presentation. I have to say, I said it to her on the day and I will say it again looking back, I didn’t even notice the stand as it was presented to me, I was too busy admiring the food to notice the tiered stand. The finger sandwiches were my favourite element, it was the sandwich geek in me, I loved the symmetry, the perfectly aligned sandwiches, they were literally a work of art, placed with a lot of love. 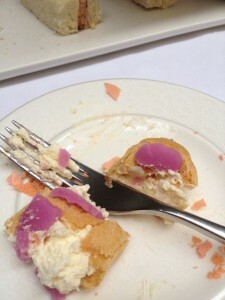 There was a choice, cucumber & sour cream, Salmon & Cream Cheese, Ham & tomato Chutney, all delicious. There was a choice of fruit or plain scones, all served warm with plenty of strawberry jam or lemon curd (a new addition to my afternoon tea loving eyes in a venue such as this, I liked that a lot) and clotted cream. 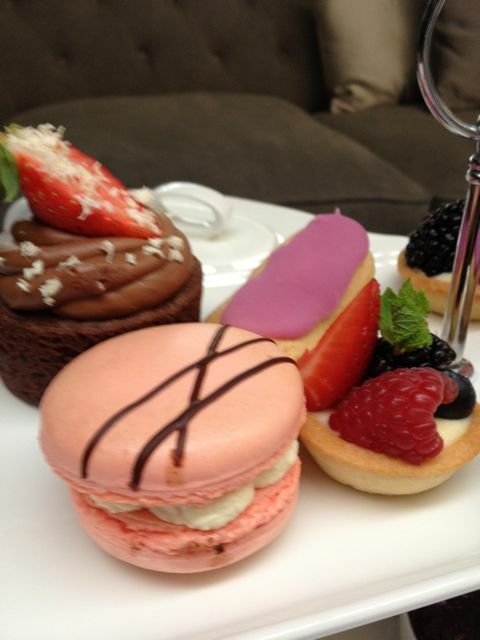 You really couldn’t say there wasn’t enough food on this afternoon tea stand, honestly. I was there a good 2 hours and couldn’t finish everything, to defeat Miss Sue Flay is becoming tough to do hehe. The cakes were ALMOST too pretty to demolish. 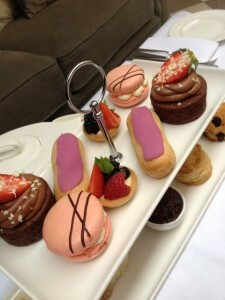 There was a raspberry jam & cream macaron, a chocolate brownie with dark chocolate frosting, fruit tartlets with crème patissière and my personal favourite, a lavender & vanilla cream eclair, which was so light, I could have eaten another had it not been for the rest of the treats on display. 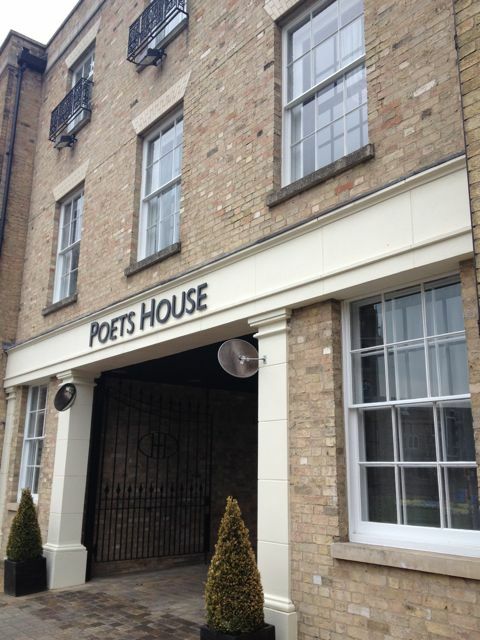 It’s already been named by The Times in its 2013 list of World Top 20 Cool New Hotels, Poets House in Ely has just opened. 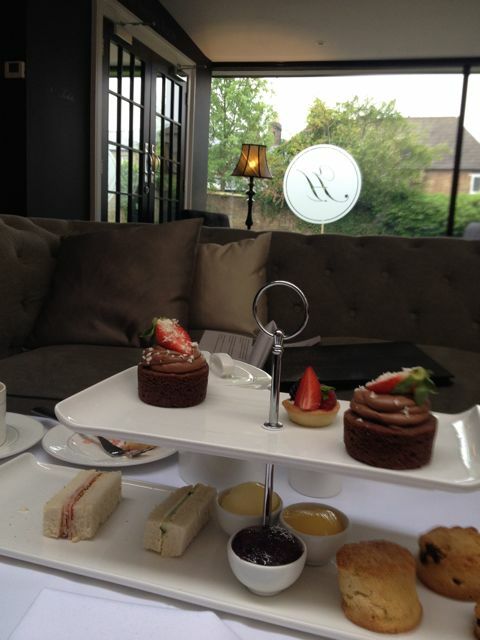 This is an independent boutique hotel that overlooks Ely Cathedral, it’s a venue worthy of a visit for any occasion, be it a business meeting, romantic dinner or most importantly, a luxurious afternoon tea. Whilst visiting, I was also given a tour of the bedrooms, which was a big mistake for me to agree to as I truly didn’t want to leave without a sleep in one of those king size beds and a soak in the bath whilst enjoying some butler service whilst visiting, but no such luck this time! The bathroom was bigger than my own one, with a double shower, perfect for a romantic shampoo if you stay. Poets House also offer some locally sourced gin from the Ely Gin Company as well as luxury nibbles for those late night munchies, who needs those dismal tea and biscuit offerings when you can have these?! After my visit to Poets House, I had to take a walk around the stunning Ely Cathedral across the road to wake myself up again before driving back to Cambridge, this was a welcome option even in the slight summery drizzle outside, Ely really is an overlooked town. I will be back to try their evening menu with my friends shortly, it’s already in discussion. Some exciting plans are also afoot for this hotel and it’s not going to be long before you all hear about their second venue locally… I personally cannot wait for this one to open for my own geekery and ideas, pinkies crossed that I will be seeing more of this fabulous team shortly! You can see my full photo album for this venue by clicking here. 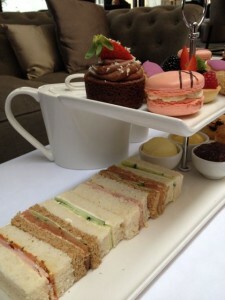 Please note – This particular afternoon tea was complimentary, following a visit to view this venue and meet the team. I am in no means obliged to blog or write about their offerings, but I simply choose to share the experience with my readers, should I enjoy the experience.